Dustin Gifford. Photo courtesy of North Vernon police. A pair of North Vernon brothers are under arrest after the theft of a vehicle early Saturday morning. 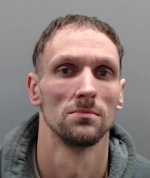 A woman called in North Vernon police after her vehicle was allegedly stolen by her boyfriend, 27-year- old Dustin Gifford of Butlerville while she was shopping at a convenience store at U.S. 50 and State Road 7 at about 4:20 a.m. on Saturday. Gifford also allegedly threatened to kill the victim earlier in the evening. Denver Gifford. Photo courtesy of North Vernon police. Police found the vehicle driving on U.S. 50 and attempted to stop it but the driver took off and shook police briefly before eventually stopping at a home in the 3000 block of County Road 550E. Police followed tracks at the rear of the home into a field and eventually caught 35-year-old Denver Gifford who was wanted on a warrant. That brother was also allegedly carrying methamphetamine in a cooler. 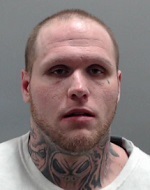 Dustin Gifford was was found laying in the field and was arrested on an outstanding warrant along with charges of auto theft, resisting law enforcement in a vehicle, intimidation, criminal confinement and theft. Denver Gifford is facing a new charge of possession of methamphetamine, in addition to outstanding warrants for possession of syringes.